Google calls web search engine results to its own services "triggers". 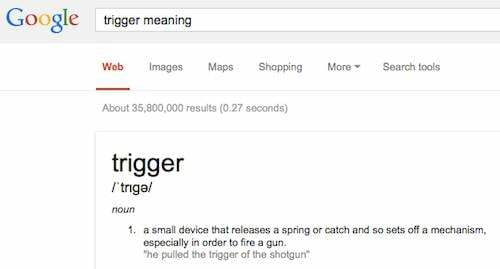 If you ask Google to define the word "trigger", it speedily returns the following result at the top of the page: "noun a small device that releases a spring or catch and so sets off a mechanism, especially in order to fire a gun." The ad giant's rivals may well say they are the ones being shot at when Google tightens its grip on a trigger. They have continued to accuse the search engine of unfairly promoting its own services over competing websites, and they want changes made within the European market. Google submitted a proposal, packaged as "Paid Rival Links", to Brussel's antitrust watchdog, which apparently offers something of a panacea to other search companies operating within the EU – a market of which Google commands 90 per cent. Basically, Google has offered to ring-fence space on its search results pages for rivals to place their own links. It hopes this will allow it to escape a large fine following the allegations of "abuse of dominance". A couple of months ago, a gagging order applied to the release of Google's reworked offer of concessions was ignored - despite confidentially clauses being agreed. The result? A leaked copy of the proposals was seen by your correspondent. Other publications also got their mitts on the docs, and details of Google's new package of business changes are now out in the open. The views of complainants in the case are slowly starting to trickle through. Will European Commission pull the trigger on Google? UK-based price comparison site Foundem has long battled against Google's alleged abuse of dominance in Europe. It is one of the best known complainants in competition commissioner Joaquin Almunia's long-running investigation into the multinational Google. The company's co-founders Adam and Shivaun Raff said today the revised proposals "suffer from all the same flaws" as Google's previous submission to the EC - which was rejected after a formal market test attacked the fundamental weaknesses of that offer. However, the commission - this time around - is seeking the opinions of Google's enemies based on a much tighter criteria, much to their despair. The Raffs claimed that the latest remedy issued to Almunia's office – particularly relating to the required adoption of Paid Rival Links – "would inflict additional grave and irreparable harm to competition, innovation and consumer choice." The Paid Rival Links element of Google's first proposals was such a patently unjustifiable escalation of the abuse Google had been instructed to remedy that few of us expected it to be retained in any follow-on proposals. It was widely assumed that Google had only included Paid Rival Links as a bargaining chip, to be withdrawn later under the guise of a substantial concession. Foundem - which claims that Almunia has had "little substantive dialogue with complainants" – is trying to advance the argument with the commission that Google would be "the main beneficiary of any profit derived from these links."